The rich history of Little Tokyo is embedded within the streets—literally. Walk down 1st Street from the old Union Church on San Pedro to the Japanese American National Museum at the corner of 1st and Central Avenue and you’ll spot a life-size timeline embedded into the sidewalk. The Remembering Old Tokyo installation traces the history of Japanese Americans in the historic neighborhood. But artist and graphic designer Kathie Foley-Meyer could sense a piece of the story was missing from the cemented images and inscriptions. “I was wondering if black people had ever lived in the area. I just had a feeling they did, and then a woman in a nearby store looked at me skeptically and shut her door,” Foley-Meyer said. “It was eerie, but right then I knew my suspicion was right.” Her fascination with what is known as the Bronzeville period was sparked. Bronzeville refers to the fleeting three-year period in Little Tokyo after Japanese-American citizens were forced to leave their homes for internment in “war relocation camps” during World War II. The once bustling neighborhood became a ghost town until an influx of African Americans moved in and transformed Little Tokyo into what became known as Bronzeville. From 1943 to 1946, the area was a nocturnal and vivacious neighborhood that fostered African American culture steeped in jazz and the arts. Foley-Meyer, who grew up on the East Coast and moved to Los Angeles in 1987, dove into Bronzeville’s history, incredulous that the time period was so forgotten and poorly documented. “If you didn’t see it, if you weren’t there to witness it, then you probably don’t know it even existed,” said Foley-Meyer. For the past two years Foley-Meyer has been working on Project Bronzeville, a multi-disciplinary art project about the time period. Foley-Meyer’s art exhibition entitled Project Bronzeville is on display from June 1 to July 21 at LA Artcore—Union Center for the Arts in Little Tokyo. 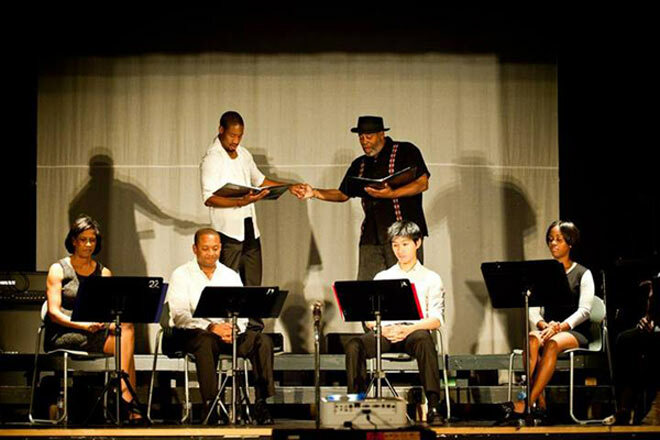 Bronzeville, a play written by Tim Toyama and Aaron Woolfolk and produced by the Robey Theatre Company at the Los Angeles Theatre Center, will run from June 29 to July 21. Based on a true story, the play follows of a black family who moves into the house of a Japanese family and discovers a stowaway hiding in the attic. Ticket information can be found here. A night of live jazz at the Blue Whale in Little Tokyo on June 23 will honor the music and culture of the Bronzeville era. Miguel Atwood-Ferguson will lead a 17-piece ensemble as they play classic tunes and original arrangements. Doors open at 8 p.m.
Scholars Christopher Jimenez y West, Ph.D. and Hillary Jenks, Ph.D. will moderate a panel discussion about Bronzeville and the larger issue of L.A.’s housing covenants at the Downtown Independent on June 22 from 2-6 p.m. More info here.